24 States participated in the 1830 census, including the new state of Missouri. 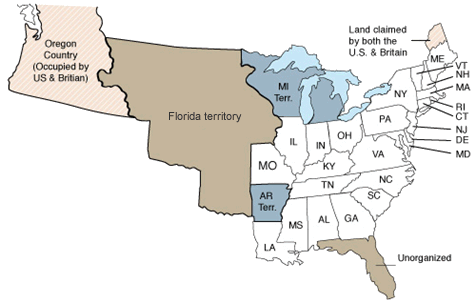 The territories of Arkansas, Michigan, and Florida also participated. Of the 12,866,020 people living in the United States in 1830, 2,009,043 were slaves. It took approximately $379,000 and 1,519 enumerators to complete the 1830 census, producing a total of 214 pages in published reports. The U.S. population increased by 33.5 percent from the 1820 census to the 1830 census. What was lost from the 1830 U.S. Census? Original records were lost for some counties in Maryland, Massachusetts, and Mississippi. Brigham Young was born in 1801 in Vermont, grew into a popular leader who spread the word of Mormonism and organized the migration of thousands of believers westward to form a new colony in Utah's Salt Lake Valley. After Joseph Smith published the Book of Mormon in 1830, Young was converted as an ardent supporter of Smith and Mormonism. Young rose to become the president and leader of the Church of Jesus Christ and the Latter-Day Saints in 1847 following Smith's death. Despite public outcry against the new religion, Brigham Young managed to successfully create a self-sufficient and isolated community in the Salt Lake Valley. Brigham Young listed in New York in the 1830 Census. January 30, 1835: First attempt for assassination of a United States president was made on Andrew Jackson. Luckily for him, the assassin Richard Lawrence’s gun misfired. May 10, 1837: Panic of 1837 begins after months of increasing inflation and shrinking credit and causing widespread bank failures and unemployment. July 2, 1839: 57 Africans mutiny aboard the ship La Amistad while en route to Cuba. Baltimore steals 2nd place from Philadelphia in the list of the largest cities in the U.S. New York City still has the lead as the largest urban area of 1830 with a population of 202,589, more than double the population of Baltimore.